There's a lot the upcoming Giver movie has changed from the book: The age of the characters, the expansion of the film into a thriller, the addition of a character who is no longer around in the book. But there's one change Lois Lowry wishes she had thought of. [It's] not, unfortunately, in the book. I wish I could go back an add it in. Among the most controversial changes to the film was the aging up of the main characters, who were 12 in the book. Lowry said that she was not sure why that decision was made, "and it was a concern of mine. [But when I first saw footage] I thought, oh yeah, it works. Right away you see that he's the same as the 12 year-old, he's young, he vulnerable, and it doesn't matter that he's a few years older." I was one of the ones who said we've got to keep them 12. I came to a point where I had to decide whether to stay on board or leave and wish them good luck. Because as I said I had planned to direct it and I had these opinions. As the Dude would say, 'That's just like, your opinion, man." Bridges said he ultimately could not see imagine looking back on this and giving up being in the film, so he "jump[ed] on board knowing it was going to be very different and then just take it as it goes." Other changes include removing a scene where the main character, Jonas, bathes an old woman. Bridges joked that it was particularly hard to lose the scene because Lowry wanted it to be her cameo. "It's the only old woman in the movie, it was my cameo!" shot back Lowry. But Lowry was able to add in touches in other places. She answered a ton of questions from Phillip Noyce, the director, via e-mail. One e-mail she sent was about the montage of memories from the past that Jonas receives. Lowry sent an e-mail saying, "You ought to have one scene from the world of Islam in there" and got it included. She also answered Noyce's question about what the boys' rooms would be like by saying they would be stark, with no personal touches. If there was anything on the walls, it would be educational, "like a periodic table." That was Harvey [Weinstein], I think. We actually wrote the character as a piano-playing character before Taylor was cast. An executive from the Weinstein Company was at one of her shows and was like "This is crazy, but it might work." The footage we saw was an extended version of the trailer, with a lot more time spent in the black-and-white world Jonas inhabits before starting to see colors. 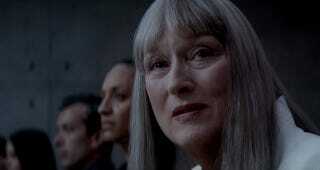 The scene where Jonas is given the job of receiving memories is a little reminiscent of Divergent, with Streep's Elder saying that he "possesses all the qualities" before going on to list them. We also saw more of Fiona and Jonas' relationship and their clandestine kiss, which takes place behind an artificial waterfall. Finally, book lovers know that The Giver is actually the first in a series of novels. Asked if these might be adapted into sequels, Lowry said that there was talk about it, but it depends on how well the first film does.